A bright blue flash and a POP! greeted me when I flipped the switch in the utility room this morning, followed by a dimmer light than normal. Yes, one of two 60 watt incandescent bulbs in the ceiling fixture blew out. I screwed in one of my newer compact fluorescent (CFL) replacements, and was appalled by the dim, sickly green color it started out with. I knew that if I waited 30 seconds or so, it would brighten up and look okay. I have tolerated crummy CFL bulb start-ups in my home office, since they eliminated a problem with short-lived bulbs. But I hate their start-up behavior when used in a bathroom, closet, or utility room where I want instant, warm, and bright light. I could have just screwed in a traditional bulb, since a few weeks ago I bought a dozen of the old-style long-life 60 watt soft-white incandescent bulbs. I had done so as a cheap precaution, since they only cost 56 cents each and I knew that they would be phased out in 2014, along with traditional 40 watt bulbs. The traditional 75 and 100 watt bulbs are already history. The phase out makes sense, given that compact fluorescent (CFL) bulbs are four times more efficient and some light-emitting diode (LED) bulbs are more efficient still. General Electric, which dates back to Thomas Edison himself, responded to the legal ban on inefficient lighting by producing slightly more efficient incandescent bulbs to squeeze under the new efficiency bar. For example, they now offer a substitute for the traditional 60 watt bulb: a 43 watt bulb which produces 750 lumens, for about 17.4 lumens/watt versus 13 lumens/watt in a traditional long-life bulb. But that still pales in comparison to CFL and LED bulb efficiencies. Halogen bulbs are also still around, offering greater efficiency and longer life than traditional incandescents, but they run very hot and don’t approach CFL or LED efficiencies. So rather than screw in another old-style bulb from my stash, I decided to think long-term and see if I could buy some bulbs which immediately produced a nice light, were far more efficient, and would last for decades, making their high up-front purchase price quite reasonable for a person who plans to keep using them for the long haul. I’ve had mixed luck with CFL bulbs. My early purchases, such as the triple U-tube 15 watt GE CFL bulb pictured here, were too long for some fixtures, not dimmable, and produced low, off-color light for a minute or more after being turned on. But the spiral Ecosmart CFL bulbs from Home Depot, which Consumer Reports recommended a few years back, are much more compact and brighten up faster, although they are still not dimmable. They run much cooler and eliminated the problem in my office ceiling fixture of frequent bulb burn-outs. LED bulbs have taken a long time to mature, but I already use two nice Philips Ambient LED 8 watt bulbs in a living room table lamp as replacements for 40 watt incandescents. They look a bit strange if you peer under the shade, with their triple yellow lenses and large metal heat sink, but they produce a warm color of light and are dimmable. 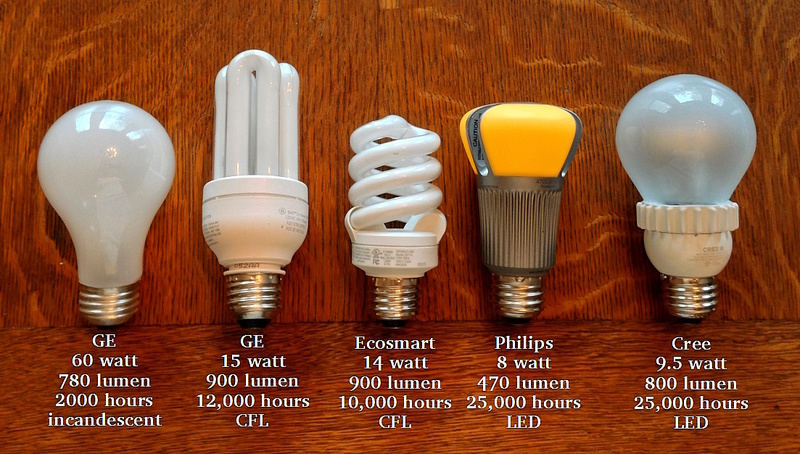 They are four times more efficient than an incandescent bulb, but the sticker shock is that each bulb cost over $20! That might sound crazy, but you have to bear in mind that they last over 12 times longer than a long-life incandescent bulb. That’s about three times the capital cost per hour, but their operating cost is four times less. So they still pay for themselves if you use them long enough, and I won’t have to replace them for decades to come. I looked into buying some 60-watt-equivalent Philips Ambient LED bulbs, but they are not cleared for enclosed fixtures. Then I remembered that Cree recently began selling relatively cheap LED bulbs at Home Depot. The bulbs have received great reviews and the company was featured in Forbes. Their 9.5 watt warm-white LED bulbs are $13 each, so their capital cost per hour over their lifetime is only about twice that of long-life incandescent bulbs. They are even more efficient than CFLs, with an operating cost that is almost six times less than long-life incandescent bulbs. So, if I use them for a couple of decades, my annual operating cost for them is cheaper than for any of my previous bulbs. I dropped in at Home Depot and purchased six of the suckers. If you decide to purchase the Cree bulbs at Home Depot as a replacement for traditional soft-white incandescents, check that you are getting the warm-white bulbs, which have a color temperature of 2700 kelvin. They have similarly-packaged and slightly cheaper Daylight bulbs which, at 5000 kelvin, produce a harsher bluer light similar to that of fluorescent lighting in commercial buildings and schools. I screwed in the new Cree bulbs in my utility room and was rewarded with instant, warm, bright light. I don’t plan on purchasing another CFL bulb for home, ever. For now I’ll still use incandescent bulbs in a few decorative light fixtures where the glass is clear to show the glowing filament. But for everything else it will be LED for me. 10/6/2013 UPDATE: A month after I published this post, Cree released a new TW Series of 2700 kelvin LED bulbs which have an improved Color Rendering Index. Today I ordered 12 of them from Home Depot for free delivery to my home, enough to replace all of the remaining 60 watt incandescent bulbs at Meador Manor. I’m going to purchase one of their LED spotlights for my kitchen. I look forward to the day they offer 100-watt-equivalent bulbs to replace the incandescents in my bathrooms, closet, and garage. This entry was posted in home repair, random. Bookmark the permalink.